The Moon Jae-in administration’s nuclear phase-out policy has begun to take shape. The Korean Energy Information Agency explains how citizen concerns are addressed. President Moon claimed during his campaign that he would support renewables and liquefied natural gas in order to boost safe and clean energy. The nuclear phaseout policy is due to partly to public safety concerns. Public support for nuclear power had started to decrease since the 2011 Fukushima meltdown in neighboring Japan. Then, in September 2016, Gyeongju was struck by the biggest earthquake recorded in recent Korean history. Shortly after the earthquake, Pandora (2016), a disaster movie about an explosion of a nuclear power plant due to an earthquake was released, increasing public anxiety. Soon after the launch of the Moon administration, cancellation of the new nuclear plants Shin Kori No. 5 and 6 was discussed. However, at that time, the Shin-Kori No. 5 and 6 were 28% completed, and cancellation of the project would have cost around 2.6 trillion won(US$2.3 billion). Following backlash from builders and local residents, the government assembled a civilian-led committee to study the feasibility of the decision to cancel the construction. The committee consisted of nine members from various industry areas; nuclear experts were not included as members of the committee to ensure it would represent the public opinion. A group of 471 citizens was formed to decide whether to cancel the nuclear plants after research and in-depth discussions. During the deliberative period, the construction of the two reactors was temporarily halted. The committee later recommended that the government resume construction. In the final survey of the 471 members, 59.5% supported resuming construction, outnumbering the 40.5% who wished to stop construction. The South Korean government followed the recommendation of the committee that the nuclear plants under construction should continue, and announced its energy transition road map last October. The plan is to gradually phase out coal and nuclear, while expanding renewable energy to 20% of power generation by 2030. Six planned nuclear reactors will be cancelled, and the licenses of old nuclear reactors will not be renewed. The 24 nuclear reactors currently in operation will be closed by 2080. In addition, the current bio- and waste energy-oriented portfolio of renewable energy will be transformed in to a solar- and wind power-oriented one. There will be support for cooperatives and citizen-based small scale solar panel businesses. Every two years, the South Korean government publishes a plan on the electricity supply and demand for the next 15 years. The 8th Basic Plan will cover from year 2017 to 2031. Peak power demand is estimate at 100.5GW for year 2030, which is 12.7GW (about 11%) lower than that of the 7th plan. The reduced amount 12.7GW is the amount that could be generated by nine units of APR 1400(1.4GW).In other words, the South Korean government expects that the power demand will decrease so much so that it will be safe enough to stop the operation of nine reactors. So far, economic feasibility has been crucial in determining the share of sources in electricity generation. But starting from the 8th plan, environmental effects and safety will be given more importance. The National Assembly has also revised the Electricity Enterprises Act in an effort to put more emphasis on environment and safety issues. In addition to greenhouse gas mitigation, clean energy sources will reduce the problem of fine dust, which has tormented the Korean peninsula for years. Because of public concern about earthquakes near the east coast where many of the nuclear reactors in South Korea are located, the government will focus on reducing risk by closing down the nuclear power plants in this area. However, there are concerns and criticisms over the government’s energy transition. Some experts insist that phasing out coal and nuclear power will increase electricity bills. The government expects that the increase in the electricity bill will be approximately 10.9% – lower than the increase in real electricity bills over the past 13 years of 13.9 percent. Some have argued that the natural conditions of South Korea are unfavorable for large-scale renewable energy. Solar and wind power plants require large-scale sites, but South Korea has limited land space with lots of construction regulations. In addition, wind velocity is slow where the ocean is shallow, and in coastal areas, the locals may oppose the construction pointing out possible harm done to the landscape and fish resources. The reliability of supply could be an issue as well. Energy independence is especially significant for South Korea for geopolitical reasons; the country is isolated from its continental neighbors such as North Korea, China and Russia. Because the 25GW of power facilities is more than enough, abolishing baseload units should not threaten energy security. The government also claims that due to technical progress in energy storage system, the reliability of renewable energy is fast improving. As South Korea joins the global trend towards energy transition, there is will be some trial and error. Germany says the key to success for its energy transition has been long-term policy consistency. It will be important for the South Korean government to maintain long-term policy consistency as well as continuing to emphasize citizen participation to lead the country toward safe and clean energy. Korea Energy Information Agency (KEIA) is a government-affiliated organization established to communicate and share objective and fair energy information, including about energy transitions, with the public. KEIA also hopes to exchange energy information and issues regarding energy transition with the world. 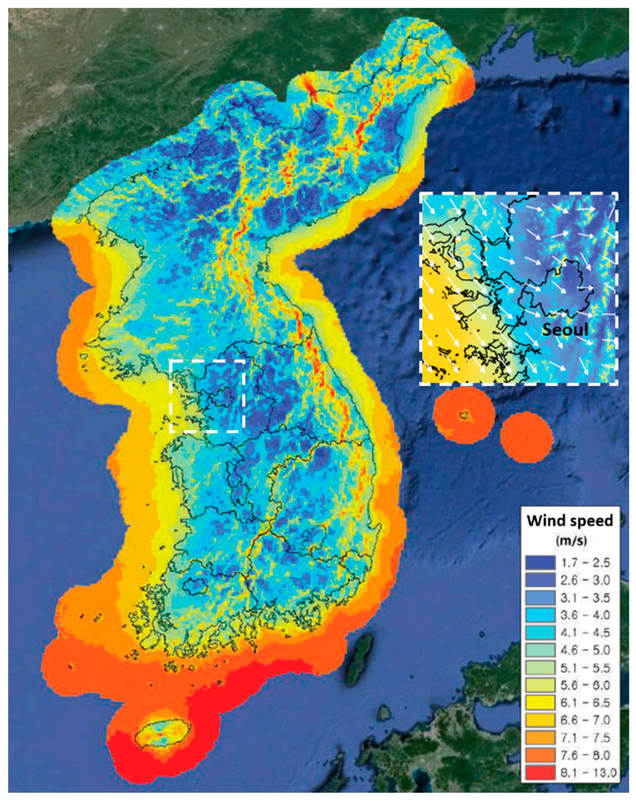 The Yellow Sea is shallow, so Korea can build fixed-platform offshore wind in the southwest, though ship navigation could be an issue (https://res.mdpi.com/remotesensing/remotesensing-08-01019/article_deploy/html/images/remotesensing-08-01019-g022.png). The Sea of Japan to the east is deeper, and floating could be the better option there. Previous PostThe next wave of renewable energy?